Trucks and trailers are the foundation of construction work. While the equipment needed for a given job tends to vary, these are two items that almost every situation will require. We offer many different types of trucks and trailers for rent or purchase. 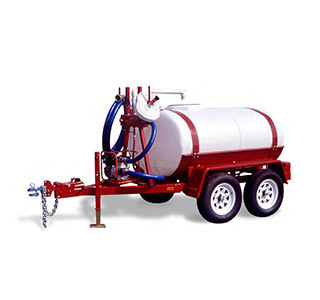 Water trucks are specialized vehicles that contain a rig for the driver, large tanks for carrying the water, pumps to pull the water out, and spray nozzles for distributing it. Smaller water trucks hold 500 gallons of water while larger models can transport 5,000 gallons of water. For moving large amounts of water, these trucks are the only option. Most construction sites require water to get the job done, whether it is for mixing materials or controlling dust to reduce lung and eye irritation. They can also be used for soil compaction to create a level base for a project. It is a good idea to have these trucks on hand if any materials worked with are a fire hazard and for cleaning up when finished.